As we consider the second principle of "justice, equity, and compassion in human relations" we cannot understand these concepts without considering their opposites: injustice, inequity, and disrespect, and when we do consider the opposites it leads to ideas of rectification of these mistakes or evil as it is often called in theological discussions. Rectification can occur without an acknowledgment of the harm done requiring the repair, but as human beings, we want to make sense out of our experience and so the recognition and the acknowledgment of injustice, inequity, and disrespect is needed so that the same mistakes and evil is not repeated, unknowingly, again. It is one thing to be unjust, inequitable, and disrespectful. It is another thing to do these things and know that you are doing them. It is a third thing, to do these things, know that you doing them, and want to rectify the mistakes and harm that has been done. It is a fourth thing to do these things, know that we are doing them, rectify the mistakes and harm, and then teach others to do the same. Often, we make the mistake of thinking that if we acknowledge our mistakes by admitting them that this acknowledgement and admission should be good enough to assuage the hurt of the victim and yet, the mere admission and acknowledgement is not enough. There are three other things that need to happen: an explanation of the factors that contributed to the mistakes and evil, a genuine apology based on an honest and whole hearted acknowledgement and explanation, and lastly, the making of amends, the repairing of the harm. Should there be reparations in the United States to African Americans for slavery? Has affirmative action policies been enough to repair the harm of ongoing racial discrimination and financial inequities of wealth distribution in our society? If a spouse "cheats" on his or her partner has there been an exploration and explanation of the factors that contributed to this infidelity occurring, along with a genuine apology, and how could the harm done by the betrayal be repaired? The path to rectifying injustice, inequity, and disrespect is forgiveness made up of four steps: a discussion of and taking of responsibility for the harm that was done, a explanation of the factors which contributed to the mistake having been made, a genuine, not a band-aid, apology based on the first two steps, and the making of amends. These four steps can take 30 minutes, 30 days, 30 months, or 30 years. The ethical imperative upon which Unitarian Universalist theology could be based is forgiveness. Can we forgive ourselves for our involvement in actions, policies, and laws that are unjust, for the times we have contributed to relationships in ways that made them inequitable, and for the attitudes we have manifested which have been disrespectful. Once we can forgive ourselves and take responsibility for the mistakes we have made, the evil we have perpetrated, then, with a humble and repentant heart, we can forgive others. Very good article. Thanks for that. It says so much that it takes some time to think about it and unpack it. As a pastor, I see couples where there has been an affair, and repairing the breach and overcoming the disillusionment is very difficult. The couple will never be the same again. How they have done forgiveness in their relationship has a big bearing on how they resolve their current hurt, pain, recrimination. Putting their burdens and sins at the foot of the cross doesn't do it even for Christian couples who have learned that Jesus died for our sins and all is forgiven. It would be nice if it were that easy, but as is pointed out. It takes more than this to restore a sense of equity in the relationship. This has been a great series and I appreciate it very much. It certainly has informed my thoughts about my ministry. 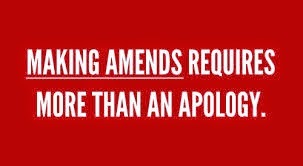 In A Course In Miracles to path to the Atonement is one of forgiveness. Forgiveness is how we restore our broken relationships. Until this is done not much else matters. The reluctance to forgive is usually based on fear. It is our fear which stops us from being aware of love's presence. Unitarian Universalism asks us to promote the inherent worth and dignity of every person. Forgiveness is often the first step in carrying out our first principle.